Underwood’s autobiography, “Newspaperwoman,” written with Foster Goss. It is full of colorful stories, but like all autobiographies it should be taken with a grain of salt. It’s probably a good time to bring a little clarity to the Aggie Underwood narrative before it spirals too far out of control. It is often said (erroneously) that Underwood (d. 1984) was the first woman city editor of a major U.S. newspaper. It’s even in her obituary. Aggie Underwood dies, July 4, 1984. Without diminishing Underwood’s achievements, she had several predecessors in the role of city editor who deserve a bit of attention, for they truly were pioneers. Reporter Julian Blanshard said: “Gotham is being introduced to the first woman ever to hold down the city editor’s desk in a large metropolitan newspaper.” (Niagara Falls Gazette, June 24, 1930). The first is Laura Vitray, who became city editor of the New York Evening Graphic in 1930. A Columbia School of Journalism graduate, Vitray was apparently the first woman copy editor at a New York paper. I love this story: “the artichoke king …. the torch killer…” It really was another era. 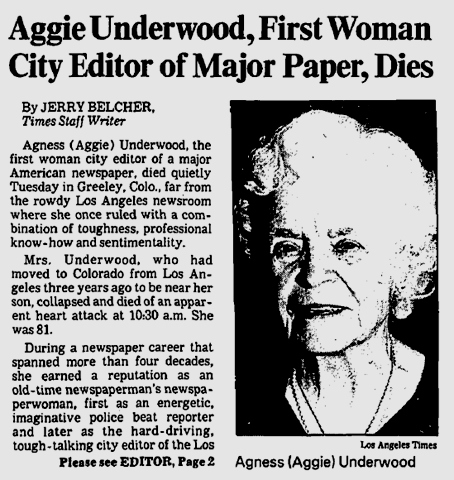 Even in Los Angeles, Underwood was not the first woman city editor. She was preceded in that role by Mary Holland Kinkaid (d. 1948), who was city editor of the Los Angeles Herald. Correction (Aug. 20 2018): An earlier version of this post misspelled Kinkaid’s name as Kincaid. Former Herald City Editor Mary Holland Kinkaid dies, Oct. 21, 1948. To be sure, Aggie Underwood is a legend in local journalism – but one must be careful in writing biographies of legends. This entry was posted in History and tagged #women's history, Aggie Underwood, Laura Vitray, Mary Holland Kinkaid, Newspapers. Bookmark the permalink. Thanks for the interesting post. I really enjoyed the exhibit at the main LA library, with photos from Joan Renner’s book The First with the Latest (about Aggie Underwood.) Well worth seeing! I believe it’s there until some time in January 2016. Aggie was careful not to make the claim of being first. She said that she had neither the time nor the inclination to check it out. Of course as far as I know she never refuted it either. The take away for me from what you’ve uncovered is that there have been many talented female journalists, each of them unique and worthy of celebration. I hope that the attention Aggie is currently receiving will result in people searching for even more accomplished women to emulate and admire. You’ve definitely confirmed that you don’t have to be first to be great–good news for all of us I think.